When choosing the most important essentials for your baby, you may be asking yourself whether you should purchase a baby changing table or not. Upon first glance, a baby changing table appears to be nothing but a simple piece of plastic or wood for you to place your baby on while you change his or her nappies. Whilst this is true in a very basic sense, a changing table is something that many mothers simply could not live without. Changing tables do serve a much bigger purpose than simply somewhere to place your baby while you change his or her nappies. Over the years manufacturers have developed some extremely innovative baby changing tables to take the often backbreaking aspects of changing nappies out of the equation. Many changing tables are designed at just the right height meaning that mothers do not need to lean over for prolonged periods of time which consequently leads and the mother feeling drained and exhausted. Aside from the fact that you will be able to change your baby’s nappies without having to crouch, many changing tables also have convenient features such as side hooks for you to hang your bags and may even come with shelving and storage units keep all your babies accessories right where you need them, just at the right time. There are many different types of baby changing tables for mothers to choose from yet the most popular style today has to be the mobile changing table. As the name quite clearly suggests, this type of table allows you to travel without ever having to rush around looking for a place to change your baby’s nappies. These types of changing tables will often folded into two and can be conveniently transported in the car or even stored behind your baby’s pushchair. As many experience mothers will know, a baby also carries with it many essential accessories that need to be transported from one place to another. The good news for mothers is that changing tables also double up as great storage units meaning that you no longer need to worry about often frustrating multitasking whilst changing your baby. Depending on the particular manufacturer, the changing table may come with either open storage trays, hooks on the side of the unit, closed drawers or a combination of all three. 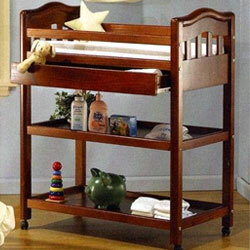 There is one particular changing table that many new parents are choosing to purchase and this is the dresser style changing table. Not only are they extremely sturdy and offer for a safe place to change your baby, once your baby has grown out of nappies you simply take the changing tray off the top of the unit and it doubles up as a nice convenient dresser for either the baby's nursery or maybe even in your own room.